Fancy Italian? Caruso Ristorante Italiano has been serving authentic Italian cuisine in Makati for almost 10 years now, but it was only recently that I came to learn about the place. Owned by true-blooded Italians Emilio Mina and Dario Gardini, one can only expect an authentic Italian dining experience. The ambiance at Caruso transports you to a Milanese-inspired setup without being too intimidating- warm-lamp lighting, chic bar area, woody accents, simple chairs, and a piano to complement the cozy and romantic vibe. In fact, the place felt quite homey and comfortable even with Italian expats enjoying their glass of wine at the nearby table. Just like most Italian restaurants, complimentary bread with the classic olive oil-balsamic-parmesan dip is initially served while waiting for the orders to arrive. Following Italian tradition, we began our meal with Caruso's must-try antipasti- a selection of cold appetizers to whet the appetite before the main course. A platter of mixed Italian cured meats such as prosciutto, mortadella, and salami served with artichoke hearts, sun-dried tomatoes, and olives. Not to be mistaken with the famous Middle Eastern dip, this cold appetizer is made of thinly sliced veal covered in a creamy sauce flavored with tuna, anchovies, oil and lemon. Insalata Russa or Russian Salad is a popular dish in Italy commonly served as an antipasto or side dish. It is basically a potato salad recipe mixed with green peas and carrots in a creamy mayonnaise dressing. Just in time for our post-Valentine lunch is Caruso's heart-shaped pizza. We had a classic Margherita of tomato, basil and cheese, but diners can freely choose other pizza flavors they want. This heart-shaped pizza is available not only during Valentine season, but all year round. Aside from the heart-shaped pizza, it's interesting to know that Caruso also has something for the kids and kids at heart. You can actually request any shape as long as they can make it. This Winnie the Pooh pizza certainly is a hit among children. I love that Caruso offers a pasta sampler so diners can try different kinds of pasta in one order. We had the Garganelli di Mamma Martina- garganelli with porcini mushroom, Tagliatelle Alla Crema di Tartufo- tagliatee with truffle cream and parma ham, and Raviolini Emiliani Ripieni al Burro e Salvia- raviolini with spinach, ricotta cheese in butter and sage. Each pasta was unique, al dente and flavorful, but I especially loved the Garganelli Porcini. The classic aglio olio pasta may look plain and simple with its perfectly al dente spaghetti cooked in olive oil and garlic, but its simplicity is what makes this dish a crowd favorite. Aside from mouth-watering pizza and pasta choices, Caruso also offers a selection of dishes made with veal- a staple Italian meat. 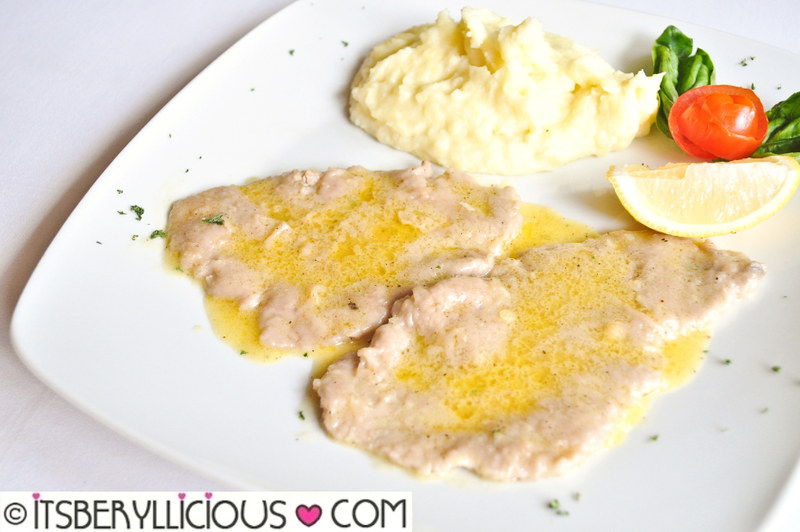 We had some thin cutlets of soft and tender veal slices, complemented by a light and buttery lemon sauce. A simple dish but bursting with flavors! How can one miss desserts, especially when Caruso serves the classic Italian Tiramisu cake- a serving of coffee-dipped ladyfingers, layered with whipped mixture of eggs, sugar and mascarpone cheese. 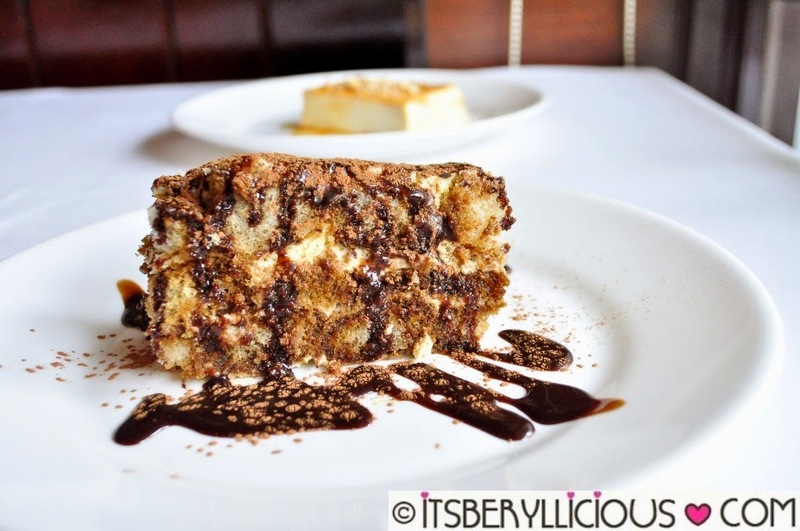 A creamier variation of tiramisu, Zuppa Inglese is made with layers of liqueur-dipped cake, chocolate, pastry cream and biscuit in marzala wine. The touch of liqueur added an unexpected kick to the sweet and creamy dessert. 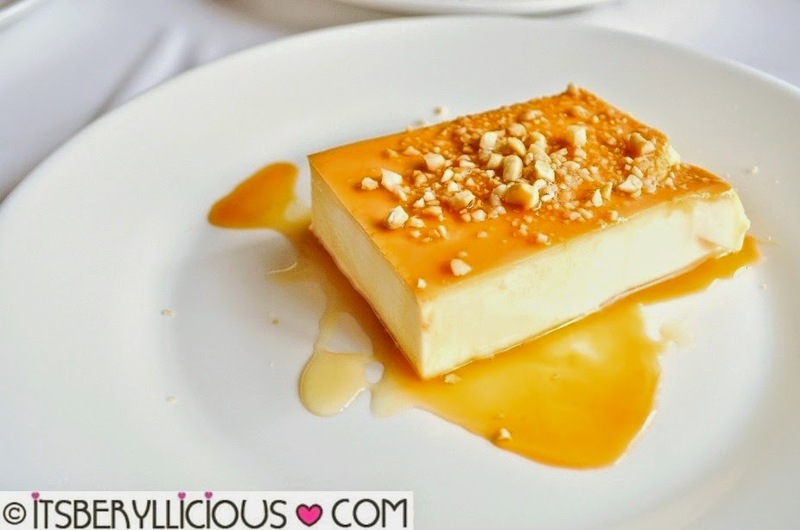 But if there's one dessert I'd recommend, it's Caruso's Panna Cotta- soft, smooth, thick and creamy Italian dessert topped with nuts and sweet caramel sauce. A must-try and definitely one of a kind!